The original term of Chinese Export essentially refers to porcelains that were exported to Western markets, particularly Europe, from around 15th to the 19thC. Commonly also referred to as Chinoiserie, these were very expensive and affordable only by the very rich or noble households. This changed dramatically with the advent of German & French porcelain making in the mid-1700s. Chinese porcelain was imported in lesser quantities and the local Meissen & Dresden and Sevres & Paris porcelain equivalents were greatly attractive to even wealthy clients that were very happy in satisfying demand while paying less. However, this trend of lower Chinese porcelain imports from the Orient over the last 150+ years has nowadays been reversed exponentially and to unprecedented levels. Although still of great quality, Chinese porcelain made in the last part of 20thC to Present is still signed with old marks that are often identical to those observed on authentic antique Chinese pieces from many centuries ago. Another category of Chinese porcelain marks that are somewhat easier to decipher are those that resemble older European makers, especially on items in Western styles. Apart from some rare but blatantly bold attempts to deceive by marking these wares with identical copies of German or French or British backstamps, a vast proportion of these reproductions bear marks that differ in some subtle ways to the original. A trained eye can distinguish these more often than not and mistakes can be avoided. 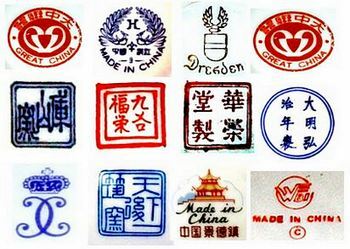 To learn more about our Chinese marks identification research services, please check out our marks reference guide - marks4ceramics - to gain unlimited access to the most comprehensive and updated list of worldwide identifying porcelain & pottery makers' marks and companies' trademarks. Our experienced specialists can also answer your questions directly for free when you need some extra guidance or have doubts (members only).